The magic of working out to music has long been recognized by fitness studios and exercisers alike. The science shows it helps by reducing perceived exertion and adding a motivational element. But it also gets artists into the ears of a whole new audience, as one New Zealand musician discovered when his song made an international workout playlist. 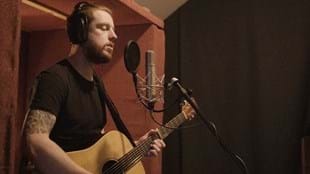 Corban Koschak – who goes by his musical nom de plume of This Pale Fire – brought the song “Curse” to life in the middle of nature in a rustic studio on a farm in Matakana, rural New Zealand. When the producers at Big Pop Studios first heard the demos, they instantly thought of Les Mills’ BODYBALANCE™ program. Having worked closely with Les Mills for over a decade, Chris van de Geer and Joost Langeveld from Big Pop knew the softly poetic sound could be ideal for the yoga fusion class. When they played it to Program Director Jackie Mills she quickly agreed. The track ended up featuring on BODYBALANCE 75, a workout distributed to 23,000 instructors and being taught in fitness centers across the globe. Not long after its release, Corban began wondering just why his fan base seemed to have grown well beyond the borders of his native Auckland – until he realized just how far afield his song had traveled courtesy of a global workout. Learn more about the science behind working out with music here.